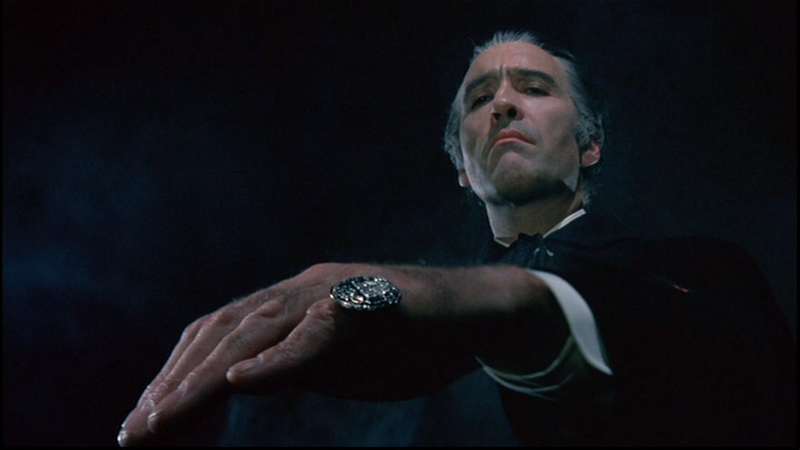 In 1872, Van Helsing (Peter Cushing, Asylum) battles Dracula (Christopher Lee, Horror Hotel) on a runaway carriage. The carriage crashes and the broken wheel pierces Dracula’s heart, killing him. One hundred years later, Van Helsing’s grandson is a London-based professor of the occult whose own granddaughter, Jessica (Stephanie Beacham, Inseminoid) runs with a wild crowd of counter-culture types. One of the group, Johnny Alucard (Christopher Neame, Steel Dawn), is an occultist with his own agenda, and he gets the group to help him conduct a ceremony that raises Dracula from the dead. Dracula’s only goal is to revenge himself on Van Helsing’s family. Will Professor Van Helsing find out what’s going on and defeat Dracula before Dracula finds his granddaughter and makes her his bride? Johnny Alucard’s “Frilly Lame Gangster” period. Dracula A.D. 1972 was Hammer Studios’ partially successful attempt to update their Dracula franchise and revitalize it at the same time. After a string of great vampire movies-The Horror of Dracula, The Brides of Dracula, Dracula: Prince of Darkness and Dracula Has Risen From the Grave, the series nose-dived with the cheap looking rehash The Scars of Dracula and the odd Taste the Blood of Dracula, which started out, like Brides of Dracula, as a Dracula-less entry in the series until Christopher Lee changed his mind and decided to reprise the role again, making for a very disjointed film. Hammer knew it needed to drastically change the series if it expected to survive, and, anticipating films like Blacula which would move Dracula to the modern-day, decided what was needed was to set the film like, now man. Yes, out of touch filmmakers put Van Helsing’s granddaughter in a hippie scene that missed the party by a few years at least. It’s easy to laugh at the kids in this film, because they are all played by actors that are too old to be acting like strangely wholesome high school honor students experimenting. Alucard’s role as the latest guy who tries to resurrect Dracula for power and immortality is telegraphed even without his exceptionally silly name, especially since Taste the Blood of Dracula used nearly the same set-up. Beacham makes for a very weak heroine, and most of the actors playing the kids are pretty dire. On the list of demerits, there is also one extremely silly vampire kill that I will not spoil if you don’t already know it. 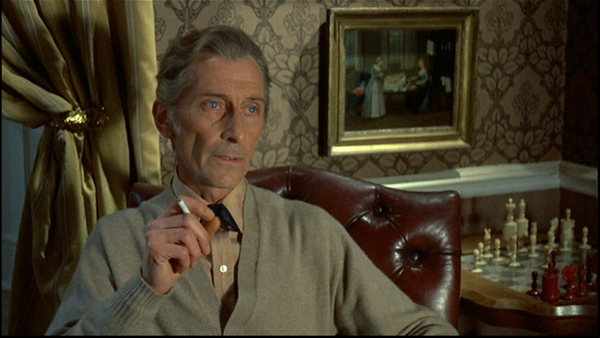 Hammer was smart enough, however, to know that merely moving their Dracula series to the present day wouldn’t provide enough oomph to resurrect the series, so they managed something they hadn’t managed since their very first Dracula film: they were able to get both Peter Cushing and Christopher Lee. The very first sequel only featured Cushing, while every sequel after that featured Lee fighting other, lesser opponents. The presence of both actors is played perfectly-these are the two great Hammer antagonists, at each other’s throats once again and playing for keeps. 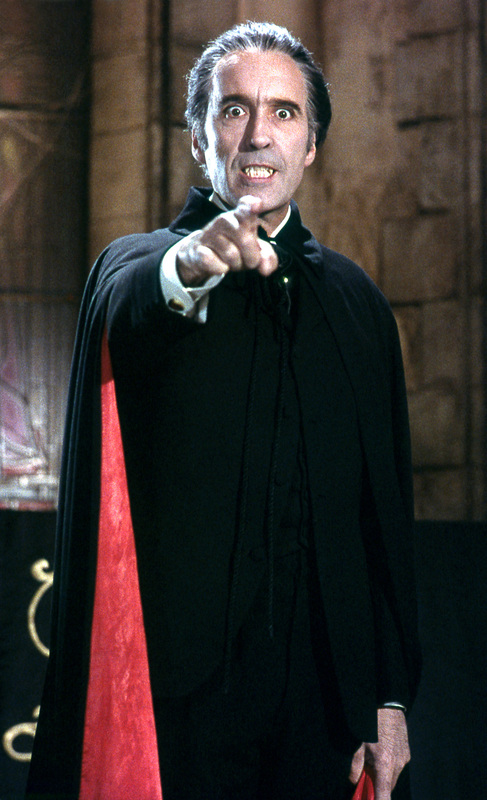 Their confrontations are some of the best that Hammer managed, because unlike in Horror of Dracula, Lee gets to deliver some great lines to Cushing, and of course there are those elaborate deaths, both of which rank pretty high on the scale of best Dracula deaths of all time. Also refreshing was the police inspector (Michael Coles, Dr. Who and the Daleks) actually believing and working with Van Helsing. Dracula A.D. 1972 is far better than any Dracula film with “today’s” date in the title and a wah wah guitar soundtrack has any right to be. It’s flaws (mainly the casting of and clueless depiction of the “young” characters) are outweighed by the wonderful conflict between two horror greats at the top of their game and the sense of seriousness and gravity in that conflict. 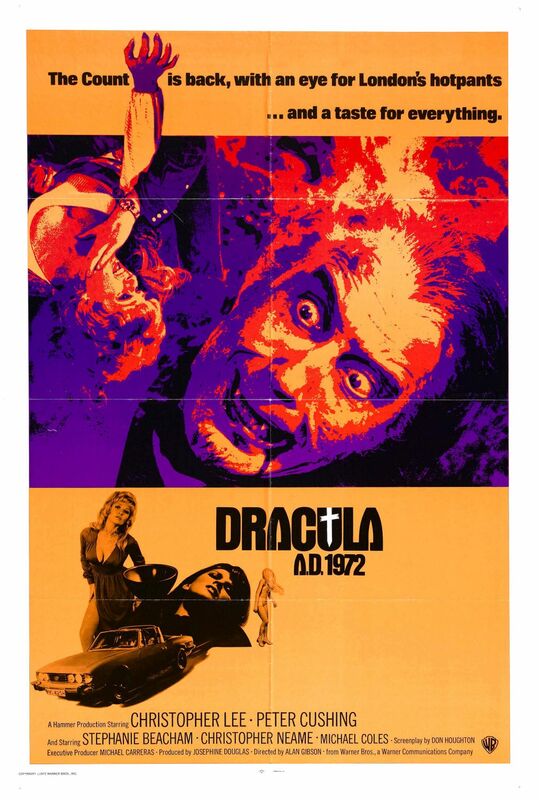 It’s a shame that they didn’t stop here, while there were ahead again for once, but Hammer would go on to make one more direct sequel, the silly “Dracula as Bond villain” Satanic Rites of Dracula and even more silly not-exactly-a-sequel co-production with Shaw Brothers, The Legend of the 7 Golden Vampires. Worth a look for fans of vampire flicks, Peter Cushing and Christopher Lee, and Hammer. 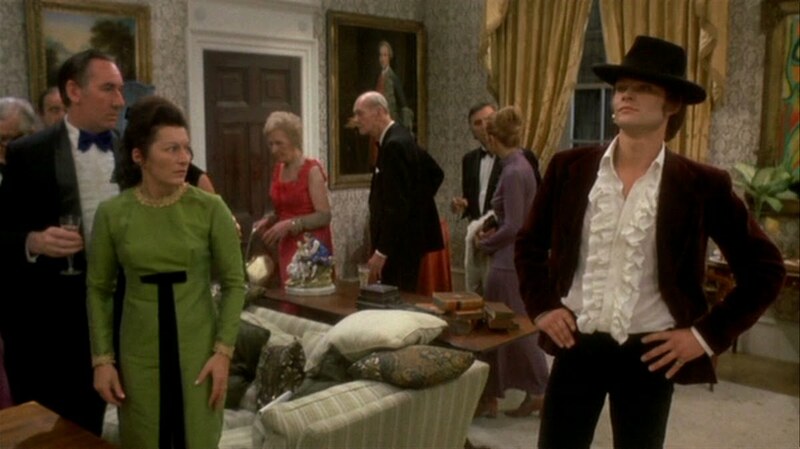 This entry was posted in Dracula, From Beyond the Grave, Full Reviews, Revenge, Reviews, Sequel, Vampires and tagged Black Mass, Caroline Munro, Christopher Lee, Christopher Neame, Hammer, hippies, Peter Cushing, resurrection, Stephanie Beacham.